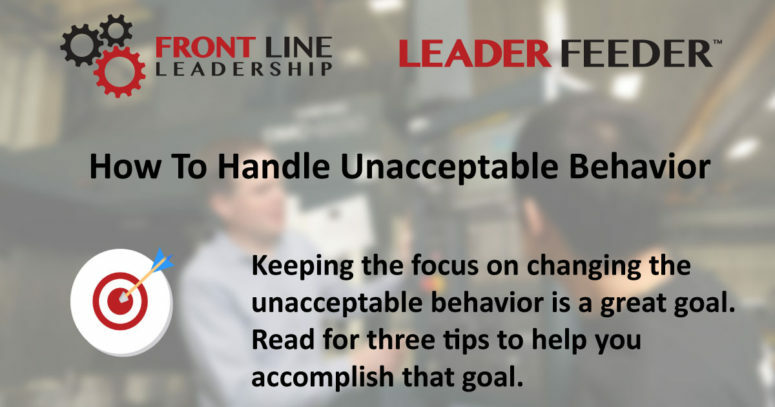 As a leader, you are expected to know how to handle unacceptable behavior and performance in your work team. Many leaders are reluctant to address behavior and performance problems on their team, hoping that it’s going to get better on its own. It usually doesn’t. One reason leaders are reluctant is that they worry a lot about how the team member is going to react to the negative feedback. Most team members will mope and give the leader the cold shoulder for a couple of days and that can really worry a team leader who wants everyone to like them. I remember talking to one of the department managers while on site with one of my clients and he said he used to worry a lot about how someone would react to the news that he gave them. It was unpredictable whether the employee would be overly angry and argumentative or whether they would cry or break down emotionally. He decided that no matter what the reaction was, his ultimate goal was to see a change in behavior. Keeping the focus on changing the unacceptable behavior is a great goal. Here are three tips to help you. Recognize that it’s your job as the leader to say something when you see something. Letting things go or looking the other way sends a negative signal that you aren’t prepared or able to deal with difficult situations. One company hired our company to facilitate some focus groups because their employee survey showed a lot of negative reactions inside the company. When the employees were asked why there was so much negativity, they said it was because management wouldn’t deal with the performance and attitude problems of their co-workers. You should know that it really bugs your high performers when you don’t deal with your low performers, affecting performance and productivity across the organization. There is no need to get overly aggressive or authoritarian. The goal is to change the behavior, not attack the person and make them feel bad. Have a calm conversation about the behavior you observed. You know the level of standards and expectation that you have. Help the team member make plans to achieve the desired change. It is important to ask for their commitment to the new plan. Hopefully, you will never get to the point where you enjoy giving corrective feedback. You can become more comfortable and confident with a little practice and experience. Being able to handle the negative feedback and negative behaviors and attitudes of your work team can help you be more confident as a front line leader.